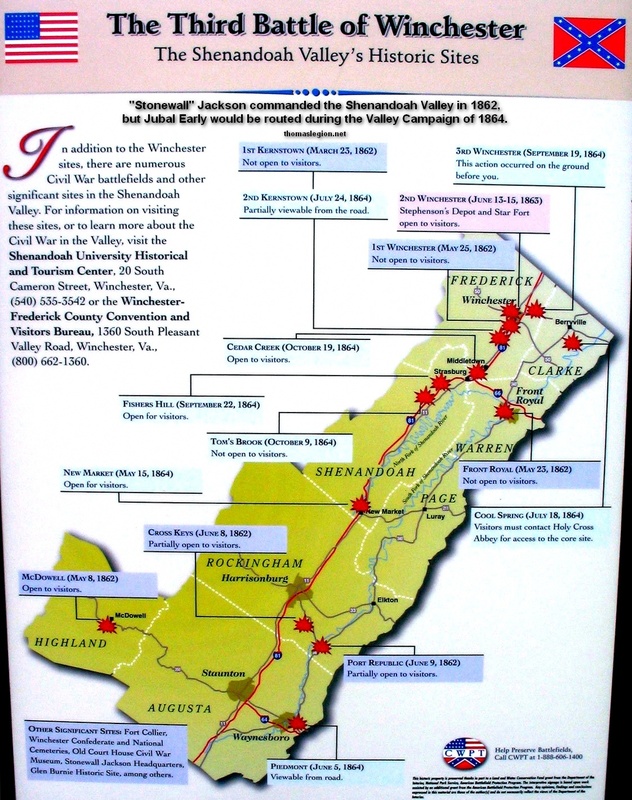 With a total of 33,000 casualties, the Shenandoah Valley Campaigns of 1864 is generally regarded as the most important of the Civil War campaigns conducted in the Shenandoah Valley of Virginia. Known as the Breadbasket of the Confederacy, the Shenandoah Valley would be the scene of two opposing armies locked in pitched battles during five months in late 1864. While attrition in both armies was the result of this contest, Lee's Second Corps, now called the Army of the Valley, had been decimated and it would be swept from the field in one final round of bloodletting in March 1865 Grant would continue to press the shrinking command under Lee, the once mighty Army of Northern Virginia, until it too capitulated just one month later in April 1865. 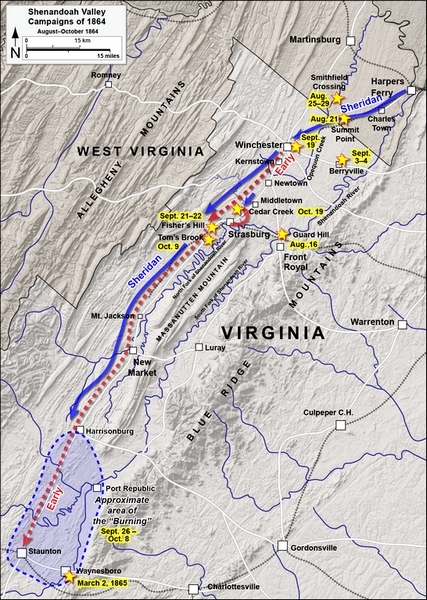 The Shenandoah Valley Campaigns of 1864 were operations and battles that took place in the Shenandoah Valley of Virginia from May to October 1864. Military historians divide this period into three separate campaigns, but it is useful to consider the three together and how they interacted. Each independent campaign had its clear set of objectives as the numerous battles were being contested during the five month span. Commonly referred to as Early's Valley Campaigns, Sheridan's Valley Campaign, Early's Raids, Hunter's Raid, and even the Lynchburg Campaign, the Shenandoah Valley Campaigns of 1864 would conclude with Lee removing Early from command while Custer and Sheridan would be commended by Grant. In May 1864, the first campaign would begin with Lt. Gen. U.S. Grant's planned invasion by Sigel, who would command the Department of West Virginia with orders to move "up the Valley" and destroy the railroad center at Lynchburg, Virginia. Sigel was intercepted by forces under Confederate Maj. Gen. John C. Breckenridge and defeated. He retreated to Strasburg, Virginia, and was replaced by Maj. Gen. David Hunter. Gen. Robert E. Lee was concerned about the Union advance in the Valley during 1864, which threatened critical railroad lines and provisions for the Virginia-based Confederate forces. As a result, Lee detached and sent Jubal Early's Second Corps, renaming it the Army of the Valley, to sweep Union forces from the Shenandoah Valley and, if possible, to menace Washington, D.C., hoping to compel Grant to dilute his forces against Lee around Petersburg, Virginia. Ulysses Grant would grow impatient with Hunter and put in motion the 1864 Shenandoah Valley Campaign, placing Maj. Gen. Philip Sheridan in command, with directions "to put himself south of the enemy and follow him to the death." Just over two months later, with superior Union numbers, Sheridan had delivered a series of stinging defeats during the largest and bloodiest battles fought in the Valley, which wrested away Confederate control of that vital region and laid much of it in ashes, forever removing its ability to sustain Confederate armies. Although smaller and less costly than another more famous campaigns, Sheridan's operations in the Valley had tremendous military and political impacts that fall. At the beginning of 1864, Ulysses S. Grant was promoted to lieutenant general and given command of all Union armies. He chose to make his headquarters with the Army of the Potomac, although Maj. Gen. George G. Meade remained the actual commander of that army. He left Maj. Gen. William Tecumseh Sherman in command of most of the western armies. Grant understood the concept of total war and believed, along with Sherman and President Abraham Lincoln, that only the utter defeat of Confederate forces and their economic base would bring an end to the war. Therefore, scorched earth tactics would be required in some important theaters. He devised a coordinated strategy that would strike at the heart of the Confederacy from multiple directions: Grant, Meade, and Maj. Gen. Benjamin Butler against Robert E. Lee's Army of Northern Virginia near Richmond; Maj. Gen. Franz Sigel to invade the Shenandoah Valley and destroy Lee's supply lines; Sherman to invade Georgia and capture Atlanta; Maj. Gen. Nathaniel Banks to capture Mobile, Alabama. The Confederacy's main objective of the entire series of battles was to pull, draw or lure Grant's army and resources away from Lee, who was pinned down in the Richmond-Petersburg Campaign (aka Siege of Petersburg), and consequently relieve Lee of the overwhelming Union resources that confronted him. Although thousands of Union and Confederate soldiers died during the hotly contested Valley Campaigns, it is perhaps the least studied and talked about of all the Civil War campaigns. Originally organized as the Second Corps in Lee's army, Early's Army of the Valley numbered approximately 14,000 soldiers. The infantry, totaling near 9,000, was organized into two corps, each consisting of two divisions. The First Corps was commanded by Robert E. Rodes, a Virginia Military Institute graduate and one of the highest-ranking Confederate officers not to have attended the U.S. Military Academy at West Point, New York. The Second Corps, meanwhile, was led by John C. Breckinridge (cousin to Mary Todd Lincoln), the former U.S. vice president under James Buchanan and a Democratic candidate for president in 1860 (ran against Lincoln). The North Carolinian Robert Ransom commanded roughly 4,000 cavalrymen, organized into four brigades. Approximately sixteen artillery batteries supplemented the army. Lt. Gen. Jubal Early's independent command during the Shenandoah Valley Campaigns in the summer and autumn of 1864 was the last Confederate unit to invade Northern territory, reaching the outskirts of Washington, D.C. The Army, however, became defunct after its decisive defeat at the Battle of Waynesboro, Virginia, on March 2, 1865. This first campaign started with Union Gen. Grant's planned invasion by Maj. Gen. Franz Sigel. Sigel, a German immigrant, was in command of the Department of West Virginia, and his orders from Grant were to move "up the Valley" (i.e., southwest to the higher elevations) with 10,000 men to destroy the railroad center at Lynchburg, Virginia. Battle of New Market (May 15): Sigel was intercepted by 4,000 troops and cadets from the Virginia Military Institute under Confederate Maj. Gen. John C. Breckenridge and defeated. Sigel, who would die in New York in 1902, retreated to Strasburg, Virginia, and was replaced by Maj. Gen. David Hunter, who later burned VMI in retaliation for the actions of the VMI cadets; Battle of Piedmont (June 5 – June 6): Hunter resumed the Union offensive and defeated William E. "Grumble" Jones, who was killed in the battle. 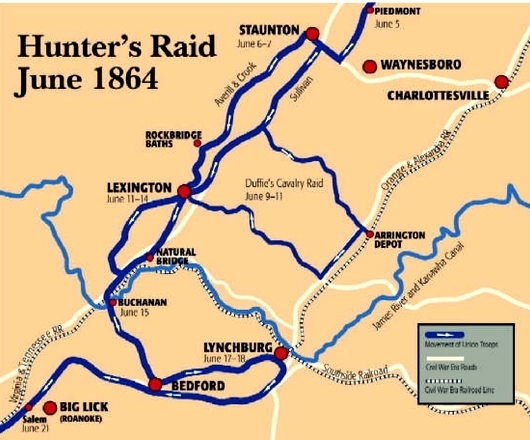 Hunter occupied Staunton, Virginia; Battle of Lynchburg (June 17 – June 18): Hunter was foiled in his plan to destroy railroads, canals, and hospitals in Lynchburg when initial units under Jubal A. Early arrived. Hunter, short on supplies, retreated back through West Virginia. Sigel was deemed an incompetent general for his disastrous performance against Breckinridge on May 15 at New Market, and replaced by Hunter, who himself would be replaced by Sheridan after allowing Early an unchecked march into Pennsylvania, where he burned Chambersburg in retaliation for Hunter's destruction in the Shenandoah Valley. 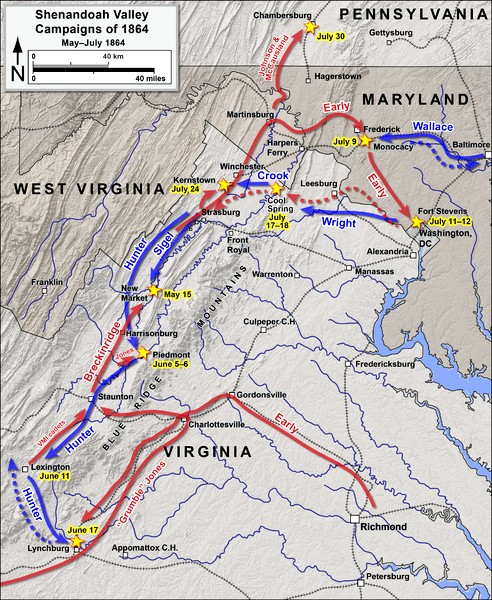 (Right) Map of Union Maj. Gen. Hunter's Raid in June 1864 through Virginia. Map shows Hunter's route, with principal battles, and Confederate railroads. Gen. 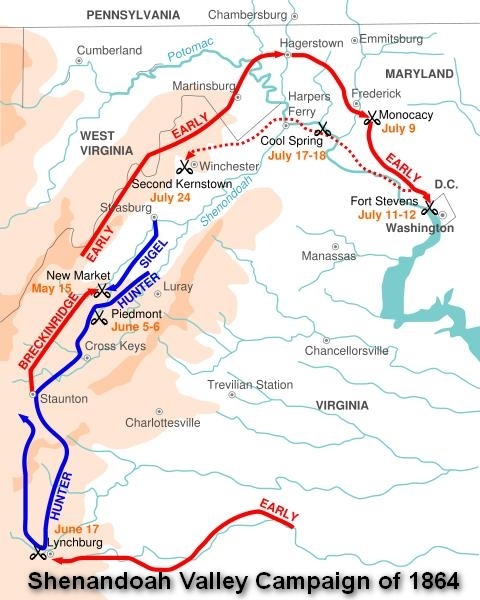 Early had a good start as he proceeded down the Valley without opposition, bypassed Harpers Ferry, crossed the Potomac River, and advanced into Maryland. Grant dispatched a corps under Horatio G. Wright and other troops under George Crook to reinforce Washington and pursue Early. Battle of Monocacy Junction (July 9): Also known as the Battle of Monocacy. Early defeated a smaller force under Lew Wallace near Frederick, Maryland, but this battle delayed his progress enough to allow time for reinforcing the defenses of Washington; Battle of Fort Stevens (July 11– July 12): Early attacked a fort on the northwest defensive perimeter of Washington without success and withdrew back to Virginia; Heaton's Crossroads (July 16): Union cavalry attacked Early's supply trains as the Confederates withdrew across the Loudoun Valley towards the Blue Ridge Mountains. Several small cavalry skirmishes occurred throughout the day as the Federals continued to try and harass Early's column; Battle of Cool Spring (July 17 – July 18): Also known as Snicker's Ferry. Early attacked and repulsed pursuing Union forces under Wright; Battle of Rutherford's Farm (July 20): A Union division attacked a Confederate division under Stephen Dodson Ramseur and routed it. Early withdrew his army south to Fisher's Hill, near Winchester, Virginia; Second Battle of Kernstown (July 24): Wright withdrew, thinking Early was no longer a threat. Early attacked him to prevent or delay his return to Grant's forces besieging Petersburg. Union troops were routed, streaming through the streets of Winchester. Early pursued and burned Chambersburg, Pennsylvania, along the way in retaliation for Hunter's previous destruction in the Valley; Battle of Folck's Mill (August 1): Also known as the Battle of Cumberland. An inconclusive small cavalry battle in Maryland; Battle of Moorefield (August 7): Also known as the Battle of Oldfields. Confederate cavalry returning from the Chambersburg burning were ambushed and defeated by Union cavalry. Battle of Guard Hill (August 16): Also known as Front Royal or Cedarville. Confederate forces under Richard H. Anderson were sent from Petersburg to reinforce Early. Brig. Gen. Wesley Merritt's Union cavalry division surprised the Confederate columns while they were crossing the Shenandoah River, capturing about 300. The Confederates rallied and advanced, gradually pushing back Merritt's men to Cedarville. The battle was inconclusive; Battle of Summit Point (August 21): Also known as Flowing Springs or Cameron's Depot. Early and Anderson struck Sheridan near Charles Town, West Virginia. Sheridan conducted a fighting withdrawal; Battle of Smithfield Crossing (August 25 – August 29): Two Confederate divisions crossed Opequon Creek and forced a Union cavalry division back to Charles Town; Battle of Berryville (September 3 – September 4): A minor engagement in which Early attempted to stop Sheridan's march up the Valley. 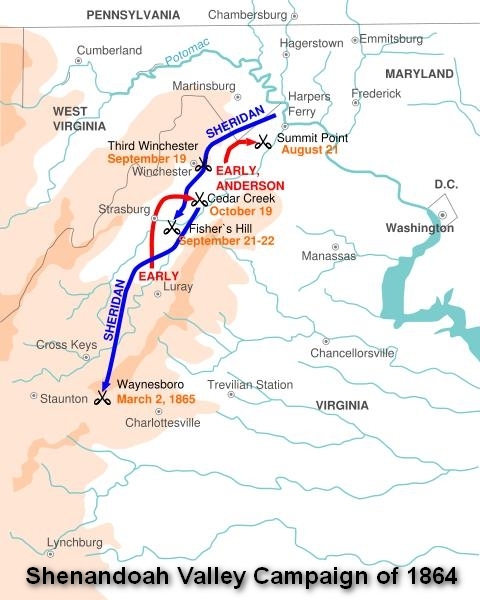 Early withdrew back to Opequon Creek when he realized he was in a poor position for attacking Sheridan's full force; Battle of Opequon (September 19): Also known as the Third Battle of Winchester. While Early had his forces dispersed, raiding the B&O Railroad, Sheridan struck near Winchester, Virginia. Sustaining ruinous casualties, Early retreated from the largest battle in all three of the campaigns, taking up defensive positions at Fisher's Hill; Battle of Fisher's Hill (September 21 – September 22): Sheridan hit Early in an early-morning flanking attack, routing the Confederates with moderate losses. Early retreated to Waynesboro, Virginia. With Early damaged and pinned down, the Valley lay open to the Union. And because of Sherman's capture of Atlanta, Lincoln's re-election now seemed assured. Sheridan pulled back slowly down the Valley and conducted a scorched earth campaign that would presage Sherman's March to the Sea in November. The goal was to deny the Confederacy the means of feeding its armies in Virginia, and Sheridan's army did so ruthlessly, burning crops, barns, mills, and factories; Battle of Tom's Brook (October 9): As Early began a pursuit of Sheridan, Union cavalry routed two divisions of Confederate cavalry; Battle of Cedar Creek (October 19): In a brilliant surprise attack, Early routed two thirds of the Union army, but his troops were hungry and exhausted and fell out of their ranks to pillage the Union camp, and Sheridan managed to rally his troops and defeat Early decisively. Recommended Reading: The Shenandoah Valley Campaign of 1864 (Military Campaigns of the Civil War) (416 pages) (The University of North Carolina Press). Description: The 1864 Shenandoah Valley Campaign is generally regarded as one of the most important Civil War campaigns; it lasted more than four arduous months and claimed more than 25,000 casualties. The massive armies of Generals Philip H. Sheridan and Jubal A. Early had contended for immense stakes... Beyond the agricultural bounty and the boost in morale to be gained with its numerous battles, events in the Valley would affect Abraham Lincoln's chances for reelection in November 1864. Continued below. Sources: Davis, William C., The Battle of New Market, Harrisburg, Pennsylvania: Stackpole Books, 1993, ISBN 0-8117-0576-5; Early, Jubal A., and Gallagher, Gary W. (editor), A Memoir of the Last Year of the War for Independence in the Confederate States of America, University of South Carolina Press, 2001, ISBN 1-57003-450-8; Eicher, David J., The Longest Night: A Military History of the Civil War, Simon & Schuster, 2001, ISBN 0-684-84944-5; Gallagher, Gary W., ed., Struggle for the Shenandoah: Essays on the 1864 Valley Campaign, Kent State University Press, 1991, ISBN 0-87338-429-6; Gallagher, Gary W., ed., The Shenandoah Valley Campaign of 1864 (Military Campaigns of the Civil War), University of North Carolina Press, 2006, ISBN 978-0807830055; Kennedy, Frances H., ed., The Civil War Battlefield Guide, 2nd ed., Houghton Mifflin Co., 1998, ISBN 0-395-74012-6; Knight, Charles, Valley Thunder: The Battle of New Market, New York: Savas Beatie, 2009, ISBN 978-1-932714-80-7; Leepson, Marc, Desperate Engagement: How a Little-Known Civil War Battle Saved Washington, D.C., and Changed American History, Thomas Dunne Books/St. Martin's Press, 2007, ISBN 0-312-36364-8; Lewis, Thomas A., and the Editors of Time-Life Books, The Shenandoah in Flames: The Valley Campaign of 1864, Time-Life Books, 1987,ISBN 0-8094-4784-3; Library of Congress; National Archives; National Park Service; Pancake, John, "Virginia Reveres Civil War Bravery", Washington Post, November 26, 2008; Patchan, Scott C., The Battle of Piedmont, Virginia, Sgt. Kirkland's Press, Fredericksburg, 1996; Patchan, Scott C. Shenandoah Summer: The 1864 Valley Campaign. University of Nebraska Press; Lincoln, Ne. 2007; Salmon, John S., The Official Virginia Civil War Battlefield Guide, Stackpole Books, 2001, ISBN 0-8117-2868-4; Wittenberg, Eric J., Little Phil: A Reassessment of the Civil War Leadership of Gen. Philip H. Sheridan, Potomac Books, 2002, ISBN 1-57488-548-0; Woodworth, Steven E., and Winkle, Kenneth J., Oxford Atlas of the Civil War, Oxford University Press, 2004, ISBN 0-19-522131-1; U.S. War Department, The War of the Rebellion: a Compilation of the Official Records of the Union and Confederate Armies, U.S. Government Printing Office, 1880–1901; Carrie Hunter Willis and Etta Belle Walker, 1937, Legends of the Skyline Drive and the Great Valley of Virginia; Davis, Julia. 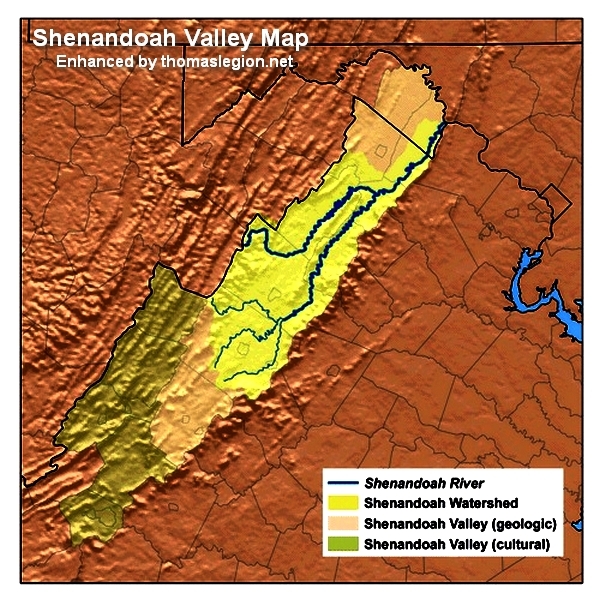 The Shenandoah. Rivers of America. Farrar&Rinehart, Inc. New York. 1945; Joseph Doddridge, 1850, A History of the Valley of Virginia; David Hackett Fischer, Albion's Seed: Four British Folkways in America, New York: Oxford University Press, 1989; Joseph Solomon Walton, 1900, Conrad Weiser and the Indian Policy of Colonial Pennsylvania.